What Neil said wasn’t new to me. But when a silver haired stranger with wise, deep-set eyes leans in from the other table to look inside your sketchbook and goes, “Drawing is really good for you, much better than photographing. You know why?” you pay attention because from the way he draws in a deep breath and turns himself around to face you, you know he has a story to tell. And I am a sucker for stories. Also a stranger telling you a story makes a great story. 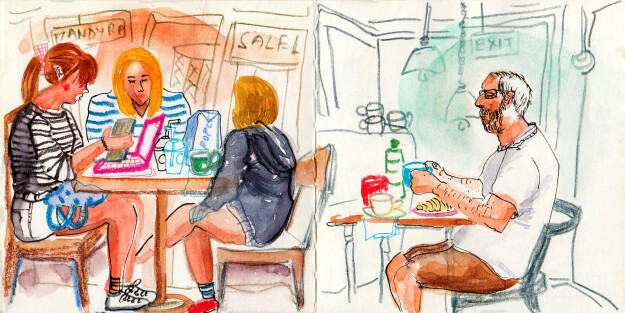 My husband and I spend every Sunday morning at Tiong Bahru Bakery. 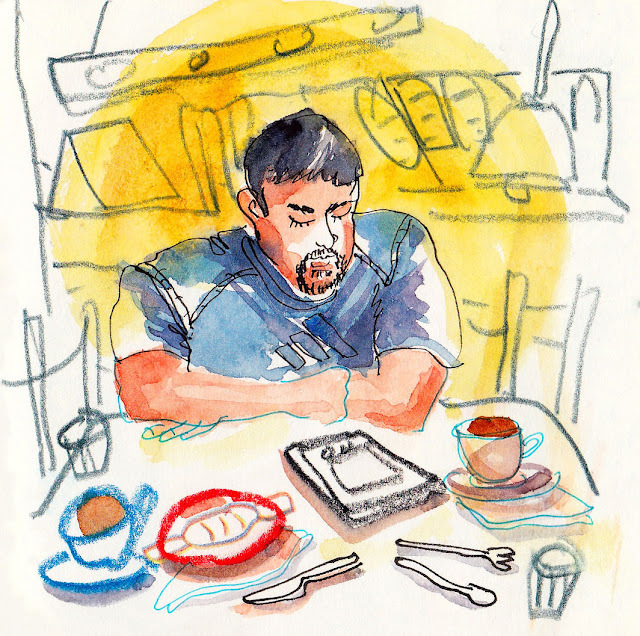 My husband (above) was reading Jeffrey Archer’s The Prodigal Daughter on Kindle. We shared a sausage roll. I had ginger lemon tea. As usual, I was scanning the room for interesting people to sketch. Interspersed below are a few of the random people I’ve sketched in the last few months. That’s when Neil, “an IT guy from Sydney” as he called himself, settled down at the next table, finished eating whatever he was eating and turned his attention to us. “Can you remember phone numbers?” Neil asked. We didn’t. Neither did he. “But my mother remembered every phone number in her contact list until her dying days because she never relied on a machine to do the work for her." He said the last bit looking somewhat disparagingly at our smart phones or so I imagined. In any case, my husband quit looking at cricket scores and pushed the phone aside pretending it wasn’t his. This was my late Sunday night view at our neighbourhood Starbucks which is open for 24 hours every day. These high stools and shared table are especially meant for people who need to work or study. Don’t miss the girl with the Micky Mouse hoodie! The last thing he wanted was a smudgy camera lens. Refusing to take chances by trying to clean it himself at the hotel, Neil went seeking professional help, hoping to receive top-notch service. Here’s where the story goes downhill – the girl at the counter whose job was to only receive the item and pass it on to the appropriate person for servicing decided to be useful that day and took the matter in her own hands. She started wiping the lens with a cloth and before Neil could say stop, his only camera lens was irreparably scratched. (L) People reading physical books is becoming a rare sight. When I saw someone the other day lost in the pages of a thick novel, I had to draw her; (R) This girl was toiling away on a Saturday night with the help of a Frappuccino and gospel music. “The Northern Lights were beautiful... indescribable really!” he said. Neil had slipped into a reverie. His head was tilted to the side and his eyes glazed over. “We watched the sky for hours y’know... and as far as I could see I was the only one without a camera.” We were crestfallen on his behalf. Before I could offer my first word of commiseration he said, “...but the incredible thing is without my camera, I could really see! Instead of looking through the lens I saw everything with my eyes... E..V..E..R..Y..T..H..I..N..G.. you know what I mean?” He pointed to his head and said, it was all stored up there, intact and distinct, even though he doesn’t have a single picture to prove to his friends that he watched the Northern Lights. But I believed him. (L) This sketch is of a bunch of girls who were trying to study but couldn’t stop talking about the movie they came out from. Also they didn’t finish their popcorn! 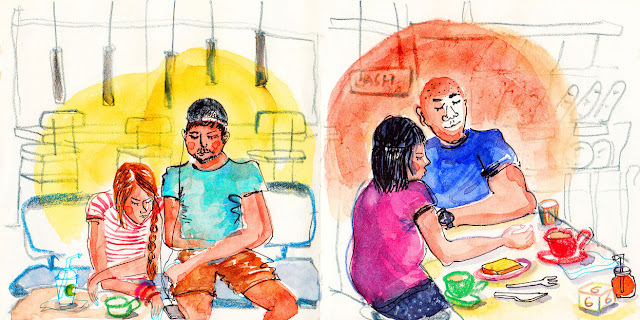 (R) This extremely hairy and incredibly talkative guy seen at Tiong Bahru Bakery was juggling two different conversations with two different families on either side of his table. Whoa! He asked whether he could flip through my sketchbook. Of course he could. We had to leave but were greedy for more stories. Neil, a lone traveler, had found two perfect listeners in us. “So as I was saying to you...” He started again. We slouched back in our chairs. “...when you draw, you see things, observe things more keenly than ever...” I didn’t check the time, but he went on for a while. We let him. (L) Just a guy seen at Tiong Bahru Bakery wearing a neatly ironed shirt and a very shiny wedding band. Neil was right. I only then realized I may have sketched over a hundred people in the last few months spending about 10 minutes per drawing. The incredible thing is I remember each one of them. Every page in my sketchbook takes me back to the actual scene. Every minute spent is accounted for. It is not just fun, drawing is a fulfilling exercise and you know it. But sometimes we all need a silver haired stranger with wise, deep-set eyes to sit beside us and tell us a story to help make sense of what we so love doing. Somali Dasgupta is a writer, sketch artist and illustrator living in Singapore. You can also find Somali on Instagram, Flickr and her blog.